Children's letters to Santa generally go unanswered, but not this year! 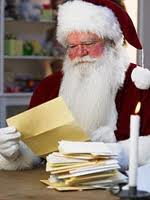 From November 25 through December 14, children may drop a letter in Santa's special mailbox at the circulation desk at the Augusta Public Library. Children will receive responses during the week of December 16. Please limit letters to one per child and provide the child's full name and mailing address in order to receive a reply. For more information, please contact Youth Librarian Cassie Banaszak at (715) 286-2070 or banaszak@augustalibrary.org.